The author, Allison Pataki is a new one for me. The Hapsburg are also new to me. As much as I love discovering a new talent there is always that fear of failure. 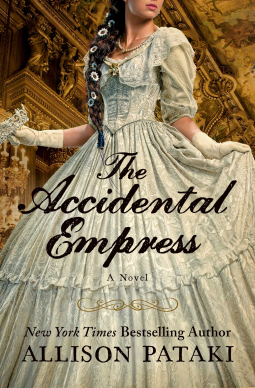 Does my anticipation mar my expectation level This isn't a small book, coming in at 512 pages (I love big books), add all the hype The Accidental Empress has generated could this be as good as I heard? Well I am very happy to report that it did, I had a very hard time putting this book down. It was written with feeling and emotion that at one point I wanted to reach into the book and ring someones neck. Creating that kind of feeling is something I think is brillant. One of the things that I love about reading a time period and location that is unfamiliar is that there are no preconceived plots nor character sketches already formed. Elizabeth is only 15 years old when we are first introduced, it is 1853. A very likeable girl, carefree and enjoying life. The author did a wonderful job of developing her character. Watching her grow from this teenager to wife to mother to empress was done in such a way that one can't help connecting with her. With all the garabage that she has to deal with (by herself) it is a wonder that she survived. It's very obvious that the author knows this time period well and has a passion for it - this is reflected plainly in her writing. The writing was smooth with descriptions that had me visualizing the country and lifestyle. The book ended in such a manner that a sequel is possible and this reader really hopes there will be one. This is Allison Pataki's second novel, The Traitor's Wife was her first, which has been relocated near the top of my tbr pile. Definitely an author I will read more of. Thank you to netgalley for giving me the opportunity to review this book.